Are you looking for ways to optimise your office space at home? The number of people working from home rises to its highest level since records began. In the UK alone, there were 4.2 million UK home workers in the first three months of 2014 (2015 figures TBC), amounting to 13.9% of the workforce. Whether you live alone, share your space with your partner or a full house with children, here are four clever, contemporary ways to maximise floor space and create a nice office space at home. If you have toddlers, you will agree that most of the time, they love hanging out around their parents, sometimes, much to our dismay when we need quiet time to meet a deadline. Mila certainly did when she was young and still does. Designed by Dutch Architects Van Wengerden, these minimalist wall-mounted desks (pictured below) have been designed with family life in mind. Fitted at different heights to accommodate little kid chair like a mini Eames style chair (available on NOTHS in white, yellow and blue), these workstations not only look great and minimalist but they are practical. The desk below was designed by Norm Architects, the Danish studio behind the beautiful Fredensborg House in Denmark and the Milk table lamp which you can see at the Skt Petri hotel in Copenhagen. 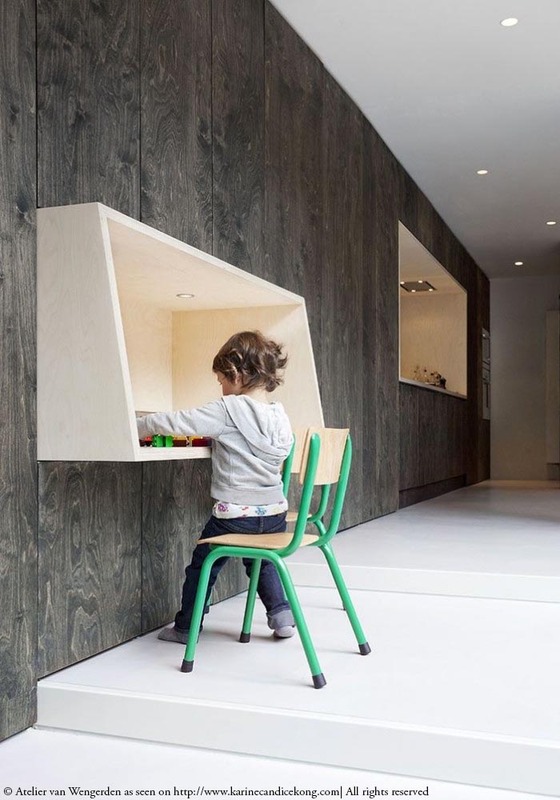 Plywood is making a nice comeback in our homes and in children’s rooms (see Anna’s post here). The plywood desk below was designed by Finnish Architect Takkunen and is part of a collection of plywood furniture called Luona In. A nice, affordable solution that can be done for children and grown-ups alike. Then, of course, there is always good old Ikea. The storage unit below is the ALGOT white wall-mounted storage solution with shelves and wall uprights. A great storage solution for creative people running a small business from their home office. Which solution do you prefer for your home? I love the little children’s desks. The sides give them a cocooned feel which children love – perfect for writing secret notes! I love the idea of wall mounted desks, it’s not something you see very often I would love to have one, but not sure how it would fit in my home study, I have a standard conventional desk in my study with a chaise lounge from decur.co.uk for my clients, but after taking a look at the pictures I may just invest in purchasing one for the childrens room.